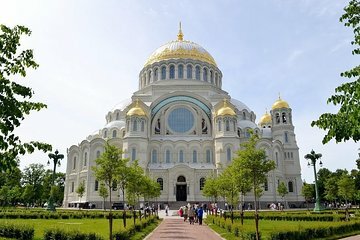 Explore one of the islands of St. Petersburg, Kronstadt, during this half-day tour. Discover the embankment, the harbor, the opulent palace and the Naval Cathedral, that looks eerily similar to the Hagia Sophia in Istanbul. Learn about the history of Kronstadt and St. Petersburg from its founding in the 1700s to present-day and admire the beautiful views of the city from the island.